There has been an issue raised regarding the Convention recently on the ‘Beach Boys Britain’ web-site. Everything is in fact under control, well nearly everything as there has been a problem with the badges. This was caused by the company who own the rights to the 2013 ‘Grammy Award’ photos and from a certain viewpoint was perhaps unnecessary. However as always in this following, needless to say we have a plan B but it will delay the sending out of the tickets and badges. 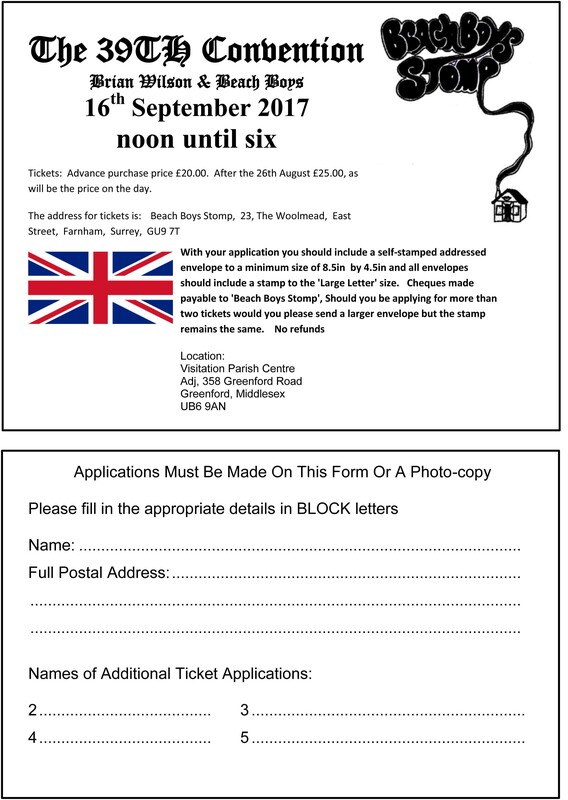 The tickets have been ready for some while and we would hope to have the badges ready for later this month As this has been the proceedure for many years we are reluctant to change this as it has worked very well. Roy Gudge… Sunday 8th May 2016. The 37th Brian Wilson/Beach Boys Convention 2016. A short statement to let everyone know what is happening in relation to the 37th Convention. The date which was given out at the event in October is NOT correct and has had to be changed following a request from Mr. Mark Linett. Who has regular professional engagements on a number of weekends each September. Following the show of hands at the Convention of 2011 when a large number of you requested to know the date twelve months hence. We have made every effort to keep to this format, however as you will be aware this is not always as easy to work, as it might appear. Thus the date for the 37th event is now Saturday 8th October 2016 at The Visitation Parish Centre, Greenford, Middlesex. Ticket prices are yet to be confirmed but are most likely to be the same as this past event. Ticket production is in hand at this very time and is actually about to receive a significant change in the design but more of this later. There will also be some live music at the 37th event but at this time it is very much early days.